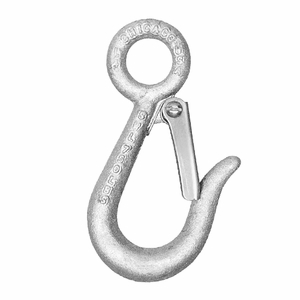 These are general purpose hooks, with a slender design that is popular for light-duty hoisting, such as on hand line ropes. In fact these hooks can be spliced into rope assemblies, in the field. They are made from drop forged steel and heat-treated with a galvanized finish. The safety latch, spring, machine screw and nut are stainless steel. Safety factor of 5:1. Made in the U.S.A.